The Multi-Functional Versa-Pad that keeps you Mobile! Just heat in the microwave for a few minutes for heat therapy or put in the freezer for cold therapy. Stays warm or cold for 3 to 5 hours. This heating pad / ice pack kit includes one- 5"x42" & two- 2"x12" elastic straps with Velcro® and an 8"x12" 40 OZ MICROCORE element plus a 24 OZ MICROCORE element to provide lasting relief for muscle or joint pains on nearly any part of the body. Keep mobile with the Versa-Pad. No need to have to sit or lay down to use. Go about your daily activities and have heat or cold where you want it. Wear it like a back support or convert it to fit virtually any part of your anatomy. 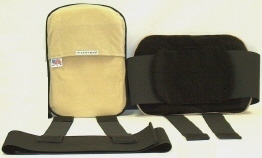 Can be used on back, stomach, chest, upper back, calf, ankle, foot, knee, thigh, hips, forarm, elbow or bicep. MICROCORE®, the technology at the core, is a family of unique patented formulations developed by Vesture® that can be made hot or cold to suit the application. MICROCORE® elements are energized by a microwave or by placing them in a refrigerator or freezer. Once it is heated or chilled, a MICROCORE® pac can maintain an elevated or lowered temperature for hours. MADE IN THE USA! • Easily heated in your microwave or cooled in your refrigerator or freezer. • Safer than gel; filled w/non-toxic liquid. • Distributes the heat or cold evenly. • Extremely durable, FDA-approved flexible outer film can withstand over one ton of pressure! This product is not intended to diagnose, treat, cure or prevent any disease. The information provided on this site is not a substitute for professional medical opinion. Pain is a signal that something may be wrong with your body. If you experience pain, you should consult your medical doctor. No medical claims are intended or implied for any products sold. The purchaser accepts full responsibility for the safe and proper use of these products.